The B.o.S. bar is a steel 28MM diameter bar, with needle bearings. Designed for Olympic weightlifting, this 700kg capacity bearing bar has the perfect amount of spin on it and is built to last. Ships for just $29 to any province in Canada or pick up free at one of our pick-up points. There's a reason barbells generally cost a lot more than these. I had high hopes based on all the positive reviews. The bar looks and feels good. The bar spin is slower than I expected for a needle bearing bar. Also, one side spins more freely/fast than the other. I guess I can't really complain, considering the price. Better than most bars in the same price range. If I were a more serious lifter, I'd likely go with something higher quality. Hey Jonathan, thank you for the review! We appreciate the feedback and can talk about this with the team. If you are having any issues with the bar, don't be afraid to reach out to us. Thanks again! Thanks for the review Greg! This bar is awesome for the price range! James, thank you for the review! We are glad the bar is treating you well and we wish all the gains for you. Thanks again! Just received the barbell and this is my first week of training. I am very impressed. I have trained on elieko is the past at my former gym and now it’s mainly rogue bars in a CrossFit gym. It is so nice to have a smooth spinning bar and that’s 28mm. It has a nice whip. Feels good in hand, the knurling is nice for snatching and cleaning, great for day after day of training. It won’t leave you hands wrecked. I would have loved a center knurl and while I love the end caps, they look great, they do come loose but that does not effect performance at all. Forvalue there is nothing better. Shipping costs for Canada are fantastic, a quarter of what you would pay for other companies. Very happy with my purchase, will definitely be looking to buy their competition bumpers next. Thanks. Thomas, thank you for the review! I have trained with this bar myself and absolutely love it for the price compared to some other companies. Keep up the great work and we look forward to the continued support! This is my first real weight lifting bar, all my previous bars have been box store olympic bars, so I am by no means an expert in bars. That being said, I'm happy with this bar in the few workouts that I've had with it so far. The B.o.S. Olympic Weightlifting Barbell 2.0 is dollar for dollar the best weightlifting bar you can buy. The B.o.S. bar is designed for Olympic weightlifting, with the perfect amount of spin and durable construction this bar is built to last. CrossFit boxes, weightlifting clubs, home gyms and even military bases across the country have been stocked with the B.o.S. barbell. What’s new in the 2.0 version? We upgraded the quality of the steel and the 2.0 bars have a whopping 250kpsi. 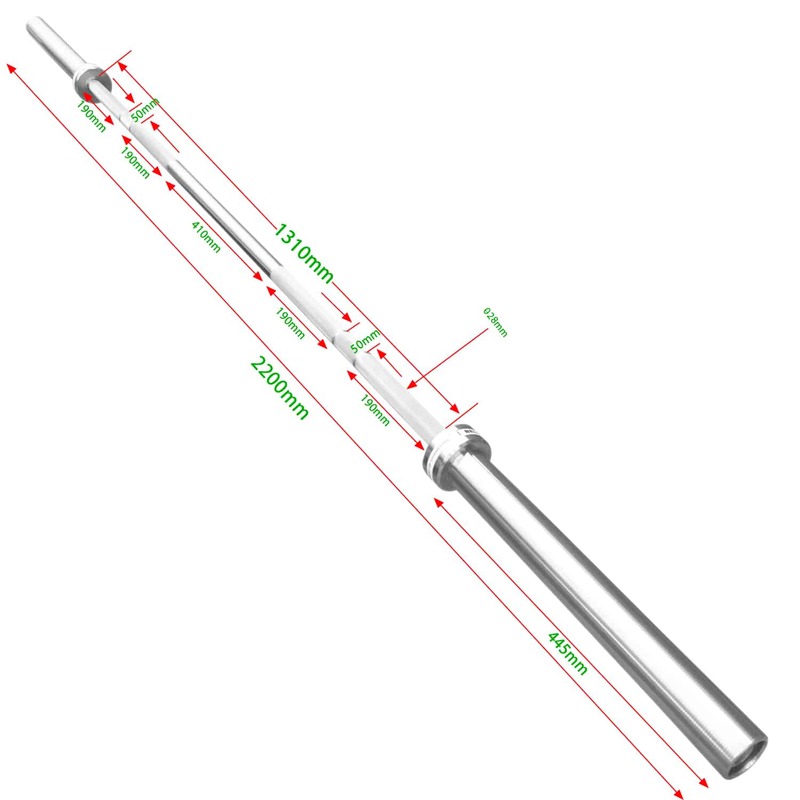 Going with a better quality steel also decreased the weight tolerance to 1% (how close the bar is to it’s claimed weight of 20kg), as well as the bar straightness accuracy to +-.25mm (no bar is perfectly straight). With 5 needle bearings and one stainless steel bushing per sleeve this bar has the ultimate spin. We machined grooves into the sleeves, this helps to prevent plates from slipping off and makes the collars fit tighter. Why Choose An Olympic Weightlifting Barbell? 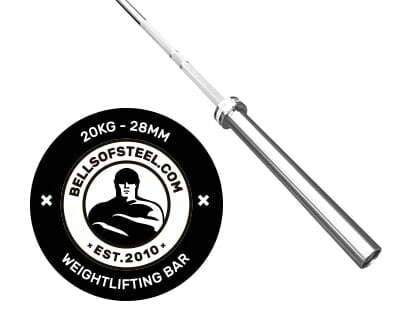 A good quality Olympic Weightlifting Barbell will spin better than a standard bushing bar. This will prevent the rotational inertia of the plates from being transmitted to the bar, and your grip, which will lead to injuries. The whip is the ability to store the elastic energy of the bar. Athletes can use this flexing of the bar to their advantage during a lift. The B.o.S. Olympic weightlifting bar 2.0 is designed to withstand repeated drops from overhead positions. Most bars, and even IWF competition standard bars have knurling in the middle of the bar. As the B.o.S. bar is intended for training, this middle knurling has been remove to prevent excess wear and tear on the lifters clean position, helping to prevent injuries. A hardened chrome finish strengthens the bar and to provides excellent corrosion resistance compared to a zinc or black oxide finish. The other main benefit being little to no maintenance is required for this finish unlike a zinc or oxide finish which requires regular maintenance. Packaged with hard thick cardboard tube and an aluminium end cap to ensure your bar arrives safe and sound.